CASHI is pleased to present Ayako Miwa’s solo exhibition Hands by the Window from Saturday, February 24 through Sunday, March 25. This show comprises a space featuring artworks inspired by everyday life and a space featuring Miwa’s mental image. Themed on ordinary items in our daily life, Miwa’s works have the shape of unmanned vegetable stall or bookshelf that we tend to overlook. They are carefully handcrafted, which detaches a part of these from their original characteristics. They appear to be something that we are used to seeing and that were taken out directly from everyday life, but with the touch of the artist, they have lost their original nature and have been transformed into art objects. 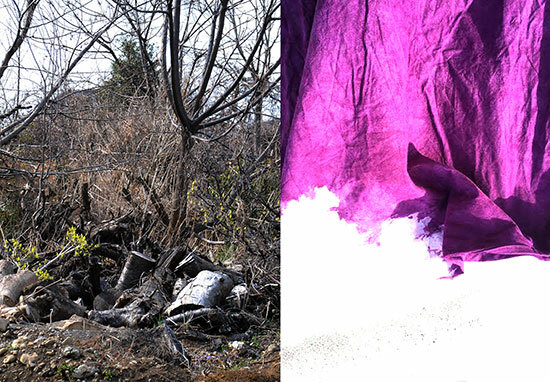 A work composed of a large amount of dead flower heads and cloth with purple iwa-enogu (mineral pigments) originates from a part of Miwa’s daily life. These items that Miwa found and collected while taking a walk daily have been made into an artwork with added effect of Miwa’s mental image. When standing in front of Miwa’s artworks, viewers experience a dazzling feeling as if they were caught off guard. This exhibition showcases Miwa’s new works only. We are looking forward to seeing you at the exhibition and please invite your friends to the show as well. * We will not hold reception party in this exhibition.